‘Above us, only sky’ sang Liverpool’s most famous son back in 1971, and it was only fitting that this line should be used when turning the former Speke Airport into John Lennon Airport back in 2001. The runways in Speke have been in use since 1930, with the airport as a whole officially opening in 1933 with flights operating to a host of UK destinations, and later across to Ireland too, the latter still being key to the airport’s success, with nearly one million passengers combined flying to Dublin and Belfast from Liverpool in 2016 alone, the two busiest routes operating out of the airport (with Barcelona in third place). During the 1960s, the airport became famous as images of the terminal filled with screaming Beatles fans were broadcast all over the world as Beatlemania was at its peak. The airport was modernised and restructured in 1986 with the construction of the ‘Southern Terminal’ to replace the original terminal that had been in use since the 1930s, laying derelict until 2001 when it was converted into a hotel. Looking to the future, a major redevelopment of the entire airport is in place with an end date of 2030 in order to further modernise and restructure John Lennon Airport from the ground up, building new terminal buildings and introducing permanent long-haul services. 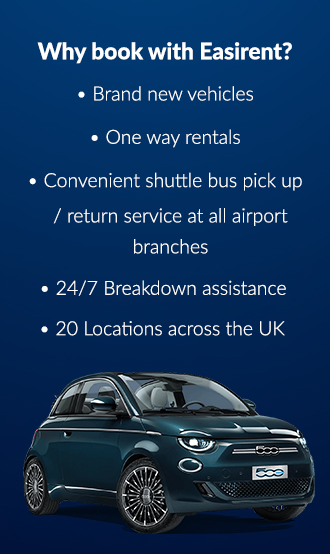 At Easirent we have a full range of new cars for hire at our Liverpool Airport Car Hire Branch. Book direct online for the lowest prices at our official Easirent.com website. John Lennon Airport is the 12th busiest airport in the UK, serving on average around 4.5 – 5 million passengers per year. It is known for short-haul national and international flights, especially with budget airline operators. EasyJet has the most amount of flights regularly leaving Liverpool, with the airport being established as the second UK base for the company back in 1997. EasyJet and Irish budget airline, Ryan Air offer regular flights from Liverpool to all of the top European holiday destinations. Other airlines that operate out of Liverpool John Lennon Airport include Bucharest airline Blue Air and Hungarian operator Wizz Air (flying to Budapest, Gdańsk, Katowice, Lublin (until summer 2018) Riga and Warsaw – Chopin Airport). A small airport, everything you need in Liverpool John Lennon Airport is located on two levels, with both upper and lower levels host to a range of eateries, shops, and amenities. Arguably, the most fun way to pass the time in any airport is to peruse the duty-free offerings on display, and maybe pick-up a bargain or two for friends, family, or just for yourself (treat yourself, you’re on holiday!) The World Duty Free section in Liverpool John Lennon Airport features all manner of fragrances, consumables, watches, sunglasses and make-up products, with selected fragrances and alcohol products up-to 20% cheaper than they would be on the high street. If you have your eye on something specific, then you can even order online and pick-up in person, with purchases eligible from one-month to 24 hours before your flight. Bear in mind applicable baggage allowances and tax laws before going on a full-blown shopping spree. There are also shopping options from Dixons for all your electronic needs (and that all important travel plug), Accessorize and JD Sports for fashion fans, daily bits and bobs and reading materials from WH Smith and SPAR and all manner of last minute Liverpool centric gifts from With Love from Liverpool. For some all important pre-flight R&R, then make a pit-stop at Obey Your Body for a range of holistic skin and beauty products or book some time at AeroSpa for a manicure, brow work, lash work or a massage. Treat yourself! If your stay at John Lennon Airport is for a few hours, then you may be craving something to eat or drink. As Liverpool is regarded as one of the most welcoming cities in the UK, there’s no chance of you sitting around with a grumbling stomach or a dry mouth for very long. For that sometimes/always necessary dose of caffeine then head to Starbucks, Caffé Ritazza or Joes Coffee House. Breakfast lunch and dinner (or breakfast dinner and tea to the Liverpudlians) is available from Subway and Burger King, if you want to grab a quick bite, or Frankie & Benny’s, the Kissing Gate and the Estuary Bar and Grill if you want to sit and take your time. Then there’s always the Beer House and the Cabin bar if you need a swift half to calm any pre-flight nerves, but don’t indulge too much at risk of jeopardising your flight. Not just a hub for shopping and dining (and all the bits and pieces associated with flying, checking in boarding etc. ), John Lennon Airport has a number of services and facilities available to all travellers. For those who like peace quiet and a little luxury after check-in, then make sure to book into the Aspire Premium Lounge on the lower level of the terminal building. Guests can walk up and pay a small fee on the day, or book in advance to save a few pounds in order to enjoy comfortable seats, free wifi, and a range of complimentary premium drinks as well as hot and cold food options. Aspire Premium Lounge is open seven days a week from 4:30am until 20:00/8pm, and guests are asked to behave and dress appropriately whilst using the facilities, with no football shirts allowed. Liverpool John Lennon Airport is proudly family friendly with a range of services designed to make what can be a stressful experience as pleasant as possible. You can opt to use the family fast track parking service (bookable online) or use the designated baby changing and feeding room facilities if necessary, whereas shops such as WH Smith offer a baby food ordering service, ensuring you won’t have too much delay at security check-in when processing and handling baby milks, formulas and other baby foods which could prove problematic. If you require special assistance for yourself or members of your party, then Liverpool john Lennon Airport are ready for you, whether departing from or arriving to the the airport. Make sure to phone or email ahead to confirm what kind of assistance you require, with a full list of airport contacts available here. Liverpool Airport also have a comprehensive guide available for those travelling with those with autism or ASD, and are happy to help with any needs any information at the airport as well as online and over the phone. Liverpool Airport’s autism and ASD guide is available here and is recommended reading for those who require it. There are also banking and money exchange services on both levels of the terminal building, toilets throughout the airport, and a multi-faith prayer room on the upper level. Luckily, a handy airport site map can be found here in case you get a little lost, and there will be plenty of staff and information points to help point you in the right direction.